The government in their Road Investment Strategy has unveiled £15.2 billion road investment under Highways England over the next ten years, with some ear marked for improving the surfacing on main routes throughout the country. The importance of this maintenance is emphasised by a predicted £2.6 billion future saving by repairing and maintaining road networks now. John Hayes transport minister speaking to the New Civil Engineer Magazine stated ‘ensuring we have well maintained roads and motorways is essential to a modern transport system’. It’s easy for roads to be left to deteriorate further causing costs later, and so it’s essential that repairs are made as soon as they occur. Here at ND Brown we welcome this investment in roads and have seen first hand the effect that neglect can have on road quality. As the days are getting drier and we’re beginning to see the full effects winter has had on our roads, now’s the perfect time to think about hot box hire. We often see an influx of enquiries for hot boxes over the summer months with businesses hoping to fit their maintenance in whilst the weather is good. We supply a wide range of hot box hire, to suit any project – whether you’re looking to repair a small area on private land or need large vehicles to complete road maintenance projects. Our fleet includes 7.5 tonne hot box, 12 tonne hot box, 18 tonne hot box, 18 tonne hot box with side tipper, and 26 tonne. 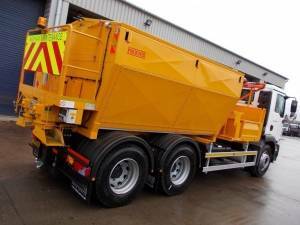 In addition to this we have our Roadmender hot box – a comprehensive hot box with hydraulically driven discharge augers and an electric cylinder winch. In addition to our hot box hire we also offer tipper hire, tipper grab hire and cage tipper hire, in a range of vehicle sizes and payloads. All of our vehicles are available on both short and long term hire options, and we service the entire country from our service centres over the length and breadth of the country. If you would like to find out more, please get in touch with our expert team.